For some reason, over the years Maine has been a summer—not winter—destination for our family. So when the opportunity to explore Sunday River for skiing came up, I was immediately intrigued. Jon has family with roots in Maine (including ties to the skiing community), and obviously, it’s a big state with plenty of snow, so off we headed this past weekend! Here are my thoughts about traveling with kids to Sunday River, which is just over 3 hours from Boston. There's a flash sale on now until the end of February 14 if you want to go grab tickets! Sunday River is massive (in a good way! )—the biggest ski resort we have visited to date. The property’s 8 peaks (!) 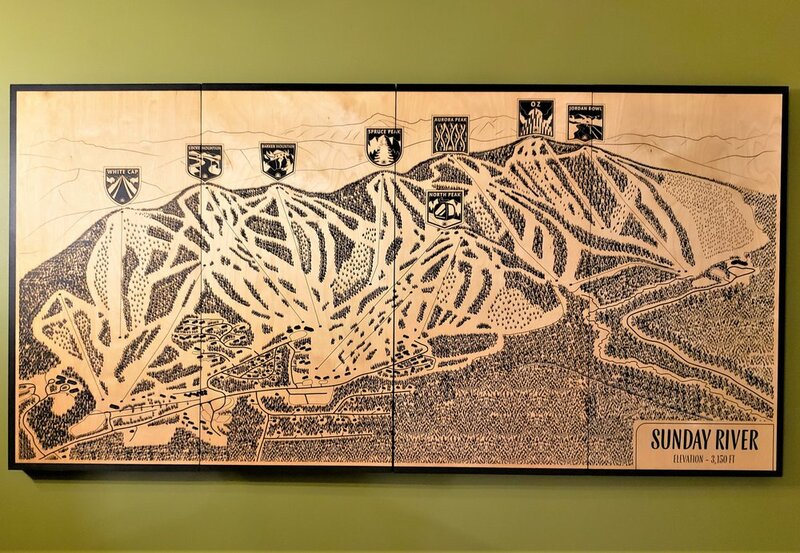 include 135 trails and glades, 5 terrain parks, and 15 lifts. Generally speaking, this scope seemed to translate to two things. First, there are plenty of trails for skiers of all abilities. Second, it’s quite possible that crowds are a non-issue given the size of this property; there’s plenty of room to spread out! (This is what we heard from other skiers + we did not experience crowd issues all weekend.) And one fabulous thing about the confluence of plenty of trails + it not being super crowded? (Crowds can be stressful for me as an advanced beginner/intermediate family where I as mama bear am worried about people running little Violet over!) We had so much fun skiing that for the first time ever we skied an entire day (Friday)—as soon as the lifts opened at 9am to 4pm closing—save a quick break for lunch. We watched the weather go from fog to rain to sun at the start of the day and were followed out by ski patrol when we closed down the lift. We felt so legit! We skied a lot of green and blue terrain and the conditions were great; well groomed and well marked (including at critical merges). The lifts we rode were all totally doable for Violet (age 7) to hop on and the operators sometimes slowed things down for her (even though she really didn’t need it!). On South Ridge it was also super fun to take the Chondola (lift #7) which is a mix of regular chair lifts + gondola cars. It was so remarkable because when we skied the bottom half of the mountain it was incredibly foggy then quite rainy. And then as we rode up the Chondola as we got to the top we could see the break in the clouds where the sun was coming through while the bottom of the mountain was still encased in gray. It was incredible! We have taken a number of ski lessons over the past few years and Jon and I agreed that our instructor Bill Corrigan at Sunday River was the best we’ve had yet! While Vi was in her lessons, Jon, Laurel, and I had a lesson with Bill, who was the perfect blend of talking and skiing. And personally, Bill helped me with some game-changing tweaks that finally got me skiing parallel! I actually screamed (in a good way) coming down the mountain on one of our runs because I was so happy! My only regret was that due to the high winds shutting down lifts (which rescheduled our second lesson from Saturday to Sunday) followed by a family emergency, we needed to cancel our rescheduled lesson on Sunday and return home earlier than anticipated. I could definitely use another lesson (or 5) with Bill Corrigan! Our family always loves studying trail maps but the scope of Sunday River made for some really fun learning with the kids (#lifeskills). For the first time ever I carried a trail map with me and referred to it at a few junctures because Violet and I took an adventure that that traversed us across multiple mountains (!) and we had to pay attention to follow different trails. It was so awesome! Given the crazy weather (on Saturday, high winds lead to closure of all but one lift so a lot of people needed to change plans) + one of our past season lift ticket buying blunders, one of the things that immediately caught my eye was Sunday River’s Threedom Pass, which gives you the flexibility to ski any three days you want (+ deals on additional ticket bookings and lodging). There are other deals too, which you can check out on their site. Sunday River’s lodging options include two ski-in/ski-out slopeside properties. Grand Summit is at the base of White Cap and the Jordan Hotel is all the way on the other side at the base of the Jordan Bowl. We stayed at the Grand Summit due to proximity to lessons and it was fantastic; we lodged in a Summit 1 bedroom suite that had kitchen amenities (including tasty coffee), a separate bedroom for me and Jon, and a Murphy bed for the girls. It worked out great. There was also a pool (we didn’t use it, but a lot of people did!) and a great restaurant downstairs (more on that in a second). One little recommendation: Due to travel fatigue we had a bit of confusion when we got there and had an unloading fail. I recommend pulling up, checking in while your car is curbside, loading a hotel cart with all your stuff, and checking your skis at the ski check one floor up BEFORE parking your car at one of the lower lots! Though I do enjoy exploring towns when we’re traveling, I also love not using our car and just staying on the property! Sunday River had plenty of great food options, whether it’s at the lodges (I had a fantastic Cuban sandwich and Laurel went berserk over her loaded baked potato at Peak Lodge) and we dined twice at Camp right in the Grand Summit, where we enjoyed delicious cocktails and food (including Maine specialties such as lobster rolls). There also was a kids buffet which Vi was thrilled about; she was thrilled to discover that whoopie pies aren’t just a summer thing. At every turn—from front desk staff to lift operators to waitstaff to the lovely man playing guitar when he wasn’t checking skis at ski check—the staff was friendly at every turn. We were so grateful! Finally, I just wanted to quickly note my appreciation for Sunday River’s eco-friendliness. I noticed eco-friendly practices across the resort, from big recycling bins in the rooms right down to the paper straws at Camp restaurant! In a nutshell, Sunday River is an awesome ski resort for families. My only regret is that the aforementioned family situation + the weather (which closed down some of the lifts and trails) got in the way of my epic plan to ski all the way from the White Cap side of the mountain over to the Jordan Bowl (basically, crossing the entire property) and back. I am eager to return to Sunday River to try again! Disclosure: Sunday River kindly hosted my family while I explored the property for editorial consideration. All opinions and experiences are, of course, my own.